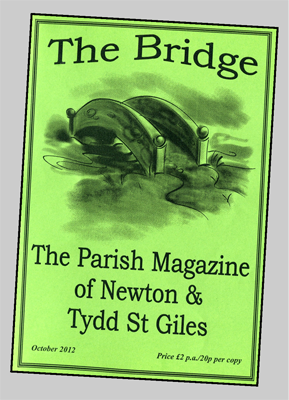 The Bridge is the essential guide to everything happening within Newton-in-the-Isle and Tydd St Giles. It was originally established as the Parish Magazine for these two parishes, as well as Gorefield, but the Gorefield link ended many years ago, with the re-organisation of the clergy in the area. As well as information about the local churches, The Bridge now includes details of all types of events and activities in the area. The cost of the magazine is just £3 per year or 30p for each of the ten editions. Everyone working to produce and deliver The Bridge is a volunteer, from the high-profile roles of Editor and Advertising Coordinator to the less glamorous and unenviable tasks of photocopying, collating, folding and stapling 400 copies each month. Further volunteers ensure that each copy is delivered by hand to the subscribers. If you're not already receiving The Bridge, please contact Kath Smith, on 870819 to request your copy.